The Kayak Club will have its first meeting on Sunday with a view to speak to members who are interested and what places you would like to Kayak/Paddle board and Canoe to within the dates set in the clubs calendar. Please ensure that if you are taking part in a canoe, paddle board or Kayak you are competent in there use so that you are safe on the water. 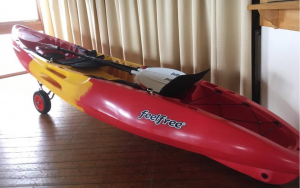 The new Club Kayak has arrived and is on display in the function room and is free to use once the member has shown competence in its use either at an open coaching session or a Kayak Club event. There is also a Kayak rack available in the dinghy pound for full members to rent a space for the year at the very reasonable cost of £10 per year. To book a space please email mooringsec@hythesailingclub.co.uk. We hope to see you there to get your input on the future plans for this section.